JUDY BECK LOBOS — ”Sketches from the Garden” Watercolor and Ink on Silk Scrolls, Watercolor on paper and Twig Art. Exhibited at MU-42 Gallery, Lancaster Pennsylvania, July, 2011. It all begins with a single brush stroke. I find it magical, how the stroke of a paint-filled brush put to paper can become a leaf, or bird, or landscape. My paintings explore the mystery of capturing a fleeting moment in time– a bird alighting on a branch or the feel of a landscape. I have always found nature intriguing and became interested in the Japanese art of sumie several years ago. Sumie appeals to me because of it’s expression of energy and spontaneity – each brush stroke matters and is irrevocable. The tradition of sumie painting is to capture the essence or spirit of a subject in the fewest possible strokes without concern for it’s outward appearance. My work with sculpture began several years ago after seeing a large sculpture made of sticks by Patrick Dougherty at the Lancaster Museum of Art. I’ve created large nests of my own, a series of spherical forms: “TumbleWood”, and an oversized teapot with a cup and saucer: “Twig Tea”. All made with twigs from my garden and the gardens of friends. Twig sculptures become 3-dimensional drawings, where lines are created by the sticks themselves. 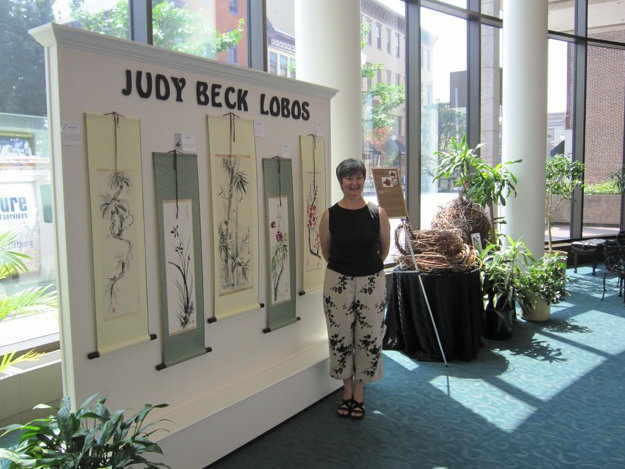 Judy Beck Lobos is an artist and gardener. A graduate of Millersville University with a degree in Art, she has studied at Anderson Ranch Arts Center in Colorado and The Penland School of Art and Craft in North Carolina. She has won awards in both local and national art exhibits. Judy’s work experience includes ink, watercolor and acrylic paintings, murals, advertising design, marketing, floral and garden design.